Financial firms are under a great deal of pressure. Not only do they need to fulfill customer obligations while adhering to strict regulations, they must also find ways to reduce waste while improving visibility into financial processes – without exposing sensitive customer data in the process. Unsurprisingly, this is a tall order for many financial firms in the Southwest. It is especially difficult for financial firms that have already invested in large-scale imaging solutions – any further improvement must be compatible with every aspect of the existing system in order to be cost-effective. PaperCut offers an industry-leading solution for tracking print processes and identifying opportunities to reduce print-related costs. It offers best-in-class performance and compatibility, including support for all major operating systems and network-enabled multifunction devices. But PaperCut offers two distinct software products, called PaperCut NG and PaperCut MF. For financial firms looking to maximize the efficiency of print processes, PaperCut MF is the ideal option because it offers comprehensive print tracking solutions for a wider range of imaging processes. For many PaperCut users, the accessible and easy-to-use PaperCut NG solution is adequate for print tracking and cost control. However, financial firms that need to capture and track copying, faxing, and scanning activity directly from their multifunction device fleets, PaperCut MF is the best possible option. PaperCut MF is designed for multifunction print fleets like those commonly found in financial organizations. Whereas the baseline PaperCut software is simple enough for an in-house IT team to implement on its own, PaperCut MF requires the support of a local PaperCut reseller because it offers a far greater breadth of features that are highly valuable to financial firms. PaperCut works by giving each employee a unique user account and tracking their usage of company print assets throughout the organization. This approach allows print administrators to determine who the biggest print users are and what they are printing the most of. Then, the software allows print administrators to set limits and incentivize economical printing while enforcing a strict, rules-based print policy. • Tracks Copy, Fax, and Scan Functions. Whereas PaperCut NG allows for comprehensive print tracking, PaperCut MF extends this functionality to all features commonly found on multifunction devices. Since financial firms commonly copy, fax, and scan documents, they need to be able to track and streamline these functions the same way they do with print processes. • Integrates Scan-to-Email, Network Folders, and Cloud. PaperCut MF is an embedded, on-board copier controller solution that works with server-based operating systems to deliver cross-platform support integrating scan-to-email, network folders, and cloud storage solutions with ease. This even applies to devices that do not support embedded software control – with the addition of a hardware copier controller. • Includes Job Ticketing for Print Rooms. Maintaining and organizing a high-volume print environment can be challenging. PaperCut MF simplifies the process by enabling print administrators to assess job ticketing priorities for print rooms. This ensures that high-priority jobs get printed first, and that a rules-based system keeps prints organized thereafter. • Supports RFID Authentication. Financial firms need to implement modern security solutions to protect customer data while complying with SEC regulations concerning the storage and transmission of sensitive data. PaperCut allows financial firms to enjoy on-demand compliance from a reputable technology provider that ensures print processes adhere to the latest regulations in effect. • Works with Third-Party Print Job Release Terminals. If your financial firm already operates with third-party print job release terminals or payment kiosks, PaperCut MF can integrate with these systems and deliver detailed analyses of user behavior through these integrated systems. One of the main differences between deploying PaperCut NG and PaperCut MF is that third-party expertise is required for the more comprehensive implementation. Since the software relies on embedded controllers being physically installed on multifunction devices, dedicated PaperCut resellers must perform the installation. As a vendor neutral solution, PaperCut MF will work with any manufacturer’s print equipment – including hybrid fleets consisting of multiple different brands and models. PaperCut does not lock its users into a certain manufacturer’s products, and neither does DSI. Our team is happy to help you find the best technology solution for your financial firm based on its unique needs. 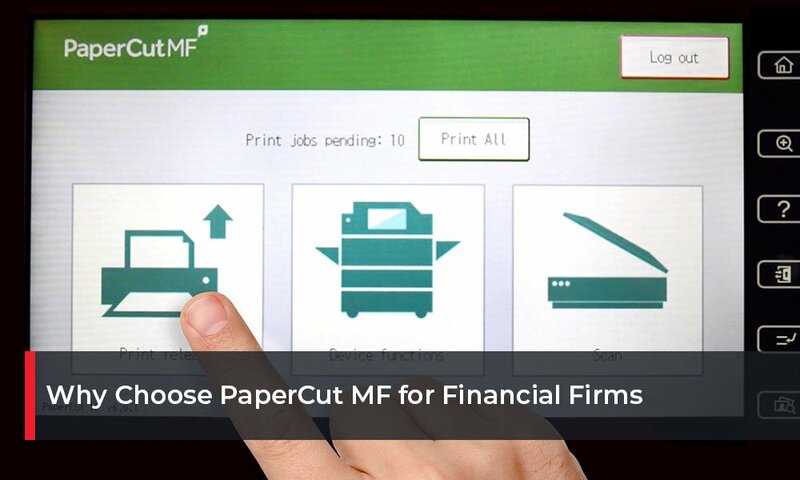 Implement PaperCut MF into your financial firm’s imaging processes and start cutting costs while improving print visibility today. DSI can help – contact us to find out how.